Don't be fooled by cheap imitations. Our UL certified LED Edge-Lit panels produce bright, even light at a fraction of the cost of traditional fulorescent light fixtures. With LEDs located in the edges of the fixture and directed with a lens, the whole panel emits even uniform light all over the surface and looks very contemporary. LED Edge-Lit panels are universal and can be used in commercial and residential applications. Great for offices, stores, hospitals, schools, hotels, etc. Our LED panels are easy to install and maintenance-free. Coming in Standard and High Efficiency Series, the panels are available in 1x4, 2x2 and 2x4 sizes, there are 22W, 27W, 40W and 60W options. ASD LED Edge-Lit panels last for 50,000 hours and come with a 5 year warranty. They do not emit heat saving you money spent for utilities. They are the perfect fluorescent lighting fixture replacement and will save you money! Please, NOTE: we provide free economy shipping within continental USA. Any extra charges associated with delivery (such as delivery of a large pallet freight to a residential address) are not covered by the seller. Please, provide business address with a loading dock for all large orders or discuss with the seller available delivery options. Due to recent changes in DLC regulations in April 2017, some of our earlier models which are DLC 3.0 are no longer eligible for rebates as they are below 100 lumens per watt. Most of our fixtures are at DLC 4.0 which currently provides the eligibility for rebates. Please refer to the specific DLC and local utility rebate information in your area to confirm which fixtures will qualify for a rebate and for how much. MEETS USA QUALITY REQUIREMENTS, UL LISTED. UL listing means that product was tested in US authorized facilities and fully complies with UL electrical code. Ideal for both residential and commercial installations. 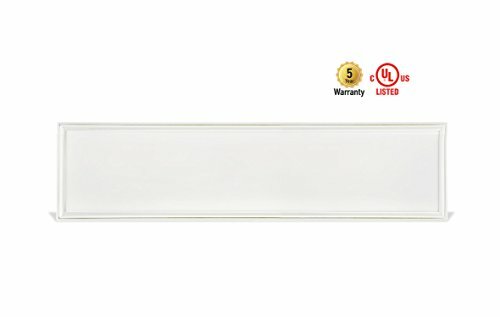 WARRANTY AND TECHNICAL SPECIFICATIONS: 100,000 hour LED lifetime, 5-year manufacturer's warranty, 5000K color temperature (daylight color), 3400 lm luminous output (the amount of light produced), 40W (efficiency), 100-277V operational voltage range. Additional technical specs can be found in the table below.